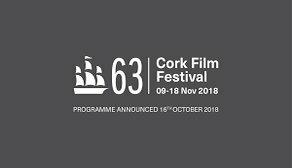 The 63rd Cork Film Festival, running from November 9-18th, is to showcase Irish and international films with a focus on current global issues. The 2018 programme for Ireland’s first and largest film festival includes features films with themes centred on LGBT, mental health, child poverty, gender equality, and human rights. Over 250 Irish and international features and shorts will be screened across the Festival, with 90% being Irish premieres. Special presentations include a cine concert of the 1920s silent horror ‘Nosferatu’ (13 November) at St Fin Barre’s Cathedral, with a new score by Cork composers Irene and Linda Buckley. This year’s collaboration with the National Sculpture Factory is Alan Butler’s ‘On Exactitude in Science’ (12 - 14 November) a work comprising Godfrey Reggio’s ‘Koyaanisqatsi’ (1983) in synchronicity with Butler’s 2017 remake. “It is fantastic that we can open the Festival with a film with such distinct Cork connections. Carmel Winters’ highly anticipated and award-winning second feature ‘Float like a Butterfly’ is a special film that fiercely challenges patriarchy and stereotypes. Carmel, and many of the cast and crew, will be in attendance for this European premiere on 9 November. The Closing Night Gala will also feature the work of an outstanding female director, with the Irish premiere of Nadine Labaki’s multi-award-winning ‘Capernaum’ (18 November). This urgent and important film is on child poverty and the denial of an individual’s human rights. Other Irish premieres of international features include ‘The Old Man and the Gun’, starring Robert Redford as a septuagenarian bank robber; Peter Strickland’s sumptuous and spooky tale, ‘In Fabric’; and Wash Westmoreland’s period biopic, ‘Colette’, starring Keira Knightley. The programme features 40 documentaries, with highlights to include veteran auteur Frederick Wiseman’s ‘Monrovia, Indiana’, and Werner Herzog’s ‘Meeting Gorbachev’, cementing Cork Film Festival as the destination festival for documentary in Ireland. Illuminate, the Festival’s unique series of film and discussion events exploring mental health and wellbeing, is presented in association with Arts+Minds, the HSE Cork Mental Health Service and Irish Rail Iarnród Éireann. Screenings include ‘Trauma is a Time Machine, For the Birds’, and ‘Ordinary People’. The fun-packed family strand will be screened throughout the Festival at The Gate Cinema. The programme includes the highly-anticipated family friendly animations, ‘The Grinch’ (10 November) and ‘The Overcoat’ (17 November), which features the voice of Cork actor Cillian Murphy. In total, 117 world-class shorts will be presented across the 10 days and will be considered for either the Grand Prix Irish Short or the Grand Prix International Short Awards. The winners of both, announced at the Awards Ceremony on 18 November at the Triskel, will be automatically longlisted for the Oscars®. Cork Film Festival is proudly supported by principal funder the Arts Council, along with Cork City Council, Screen Ireland, Fáilte Ireland, Screen Training Ireland, Culture Ireland, Creative Ireland and Creative Europe Media. Click here for further details about the Cork Film Festival.